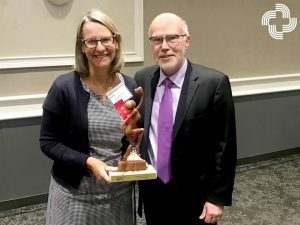 Dr. Juliette Kalweit, a doctor for Serenity Hospice and Home and also at Swedish American hospital, was recently named a Woman of Achievement at the YWCA Leadership Luncheon in Rockford. Dr. Kalweit, exemplifies excellence, commitment to success and is a role model for future generations. She was the first board-certified hospice and palliative care specialist in the region and before helping those at the end of life, Dr. Kalweit was a popular family medicine physician who helped bring more than 1,500 little lives into the world. Her selflessness, caring spirit and genuine passion make a lasting impact on patients and their families. Dr. Kalweit’s commitment to the healing profession not only is an inspiration to her colleagues, but also to young girls and women who are considering a future in healthcare.